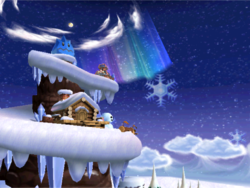 Freeze Mountain is a snow covered mountain in Dance Dance Revolution: Mario Mix. Mario (or Luigi) and Toad arrive looking for the next Music Key that is at the top of the mountain. It is World 4 of the Story Mode. Toad tries to climb the mountain, but it is too slippery. There is a Warp Pipe near that leads to the underground of the mountain, so Mario and Toad take the alternate route. Inside the mountain is a lot of Penguins, Mr. Blizzards and Cheep Cheeps. After going through the inside the cave, Mario and Toad find a warp pipe that leads to a higher part of the mountain. Up there, Toad says it is getting cold. Fortunately for them, there is a house there. Toad says if they danced enough, they will be hot. After warming up, they decide to keep climbing the mountain. At the top, they find a Giant Freezie with the Music Key on its head. Mario dances to warm it until the Freezie melts. After getting the last Music Key, Mario and Toad climbed down the mountain, avoiding the Ice Spinies. This page was last edited on May 25, 2018, at 18:53.